Since I came back I have been working hard in my fish closet to do rearrangements to accommodate all the new fish and set up some new tanks for breeding as well. So, I was setting up a 5 gallon for the breeding of my pencil fish. I had finally found fake grass in the dollar store to serve as an egg collector. One of the things I needed to do was to change filters from one tank to another. 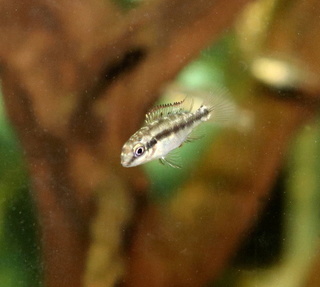 I decided that the Nannostomus would be better with the sponge filter than the peacock gobies that share a tank with a female banded gourami and betta. 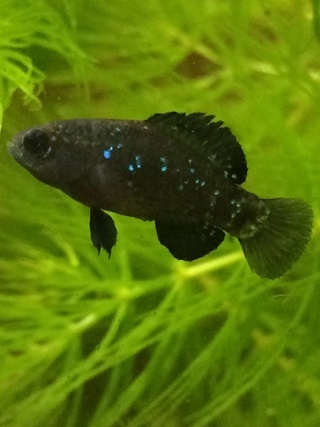 When working on that, I noticed that the peacock male was gone. Two days ago he was still there. I looked in one of the tube lengths and yes, eggs! Plus the male of course. So you can imagine that the pencilfish breeding is off for the moment. I am now ensuring that the temperature in the goby tank is the same as the 5 gallon before transferring the tube with the father. It looks like I will not be sleeping anytime soon! This is awesome news!! Can't wait to hear that you have new babies!!! That's a very positive reason for a change of plans. Hope all goes well. Sounds like a very neat change in plans - Looking forward to updates! I cannot agree more! 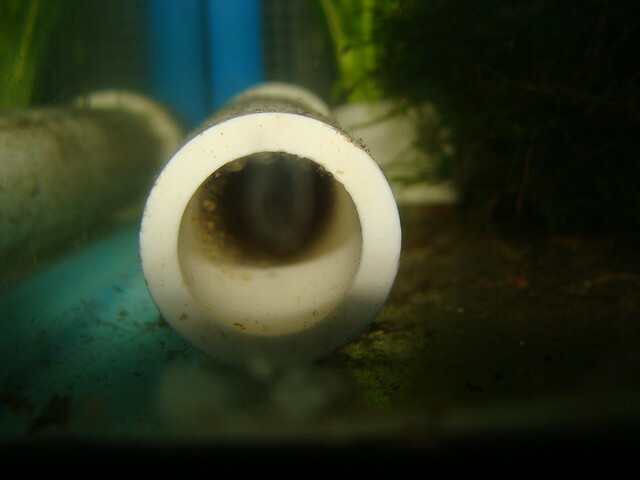 So far so good, this morning the male is still in his tube in the new tank. These fish came from David; it are the same 3 females and male from whom he had fry. 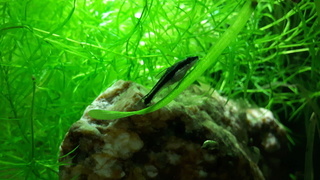 I can really recommend this fish: beautiful, interesting and very well suited for small tanks. Good to hear that he's back to his old habits! Now you'll be seeing him do that little thing about 2 times a month, they are really prolific. I love this fish but he's being a terror to anyone smaller or the same size than him. @l_l_l wrote: Good to hear that he's back to his old habits! I have been wanting to breed these for some time now. When did you remove dad? Do I remember correctly that you fed them decapsulated brine shrimp in the beginning? 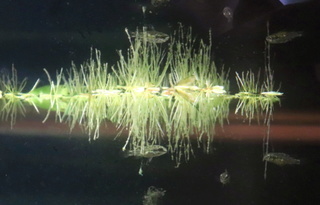 The picture is not too clear but if you look carefully, you can see the embryos in the eggs that are hanging on the ceiling of the tube. I removed the dad as soon as I saw he was out of the tube! I then artificially aerated the eggs with a bubbler. Yes I guess it does change your plans, good luck with the new offspring. This is a good change. What a great thing to discover. I love finding good surprizes in my tanks. Sounds like a good plan and good luck.